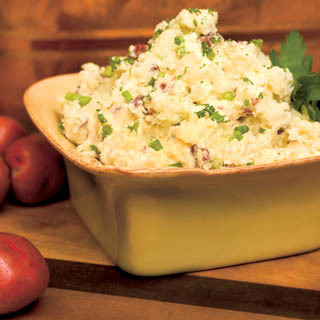 Turn classic mashed potatoes into these delicious smashed potatoes. Nutrition Highlights: Leave the skin on potatoes – half of its nutrients are located in the potato skin. Put potatoes in a large saucepan; add cold water to cover and ½ teaspoon salt. Bring to a boil, reduce heat to medium and continue to cook until potatoes are tender when pierced with a knife – 15 to 20 minutes. Meanwhile, heat half-and-half with butter in a small saucepan and bring just to a simmer. Drain potatoes and return them to pan. Use a large metal or wooden spoon to smash the potatoes into a coarse mash. Add half-and-half mixture and Boursin cheese. Stir in scallions, add salt and pepper to taste. Serve immediately.